Disney has recently experimented with home release schedules for its major titles — last year’s Wreck-it Ralph, for instance, launched digitally weeks before physical copies hit shelves. Monsters University is the latest movie to follow suit; Amazon and iTunes now have the film up for download in HD ahead of its October 29 Blu-ray release. Fans will be happy to hear that the digital version includes most of the extras set to come with the traditional release later this month. Those looking for a standard-definition download will still have to wait until the 29th. Download the film at iTunes or Amazon, or pre-order the Blu-ray or DVD edition today. Are you catching Monsters U for the first time? Let us know below! ‘Hawaiian Vacation’ + ‘Small Fry’ Now Available on iTunes! Pixar’s short films are normally put up for purchase on iTunes shortly after their theatrical debuts, but the two Toy Story Toons that were attached to Cars 2 and The Muppets last year never premiered on the service. Finally, though, the pair of hilarious shorts are officially available on the US iTunes store! Hawaiian Vacation was included on the Cars 2 DVD, but this is the first opportunity to own Small Fry at home. Both shorts are full of charm and wit, despite suffering from a rushed pace to pack in as many characters as possible. Hawaiian Vacation and Small Fry are each available for $1.99 here and here, respectively. Don’t be surprised to see these shorts on the second volume of the Pixar Short Films Collection later this year, as well. Are you excited to see more Toy Story Toons in the future? Toy Story 3 + iTunes Extras! You’ve heard the perks of owning Toy Story 3 on Blu-ray, but what if a physical copy just isn’t your thing? Missing out on bonus features and a high resolution image isn’t an option, but a Blu-ray Combo Pack is just too much clutter. That’s where iTunes Extras comes in. • Studio Stories: Where’s Andrew Gordon? I’d like to just make a quick note that my shelf is quickly running out of space, so switching to digital might be my only option soon. Toy Story 3 hits digital download on November 2nd— same day as physical copies. Click here to pre-order Toy Story 3 on the iTunes Store for only $9.99. After a lackluster news week, I’m happy to present a post chockfull of Pixar goodies. Unkrich + Arndt on NPR: The writer and director team behind Toy Story 3, Michael Arndt and Lee Unkrich, took question during a segment on NPR’s Fresh Air talk show. You can listen to the 37 minute segment now or check out the accompanying article on NPR’s website. iTunes Pushes Pixar Rentals: Today, the iTunes Store is prominently displaying an ad promoting the Lamp’s library. "Relive the magic of these beloved animated classics from Pixar — now available to rent." reads the slide. An image of the promo can be seen to the right. George & A.J. Now Available on Facebook! What’s "Up" with the storyboarded short film, George & A.J., that was (unfairly) only available as an iTunes exclusive? Well, now this Josh Cooley directed vignette can be seen by everyone on Disney•Pixar’s official Facebook fanpage! George & A.J. is laugh-out-loud hilarious and certainly well thought out as it expands on the film’s background story. It’s too bad that this short wasn’t a part of the Up Blu-ray/DVD, it would’ve made for another great addition. Plot: Turns out the Shady Oaks caretakers have only gotten a taste of what’s to come after Carl’s departure for South America. The elderly from across town have been inspired by Up’s protagonist and are wreaking havoc with the duo! Watch as old folks go wild in George & A.J. over at this link. Look out for some great Carl, Russell and Dug moments too! Thanks to the gracious folks at Disney•Pixar for making this short available for free to the fans! Your thoughts? Up iTunes Extras: George & A.J. With the latest major update to Apple’s music downloading software came iTunes Extras, a little incentive to download movies for exclusive content. As expected, Up has joined the party. Besides the cool iTunes Extras menu, this release of Up has another feature not found on Blu-ray or DVD! It’s a brand new short film titled George & A.J. which follows the two Shady Oaks caretakers in their continuing "adventures." You may remember the duo from the lift off sequence in Up when they came to take Carl away. The short is directed by Josh Cooley and features the voices of Pixarians Jason Topolski (George), A.J. Riebli (A.J. ), Bob Peterson (Dug), Peter Sohn (Russell) and Steve Purcell (Carl). It plays in full color storyboards, much like The First Draft from A Bug’s Life Blu-ray, I’m guessing. To own this extra, follow this link to iTunes where you can buy it in standard definition for $14.99 or in HD for $19.99. With this download you’ll also receive Dug’s Special Mission, Partly Cloudy and two Up featurettes. Unfortunately, I don’t believe the digital copy bundled with the Up Blu-ray will unlock the extra features. So, who’s seen George & A.J., what did you think? Pixar has recently added four movie based shorts and a bonus pre-Pixar short to their iTunes store. New to the list are Mike’s New Car, Jack-Jack Attack, Mater & the Ghostlight, Your Friend the Rat, and Lucasfilm’s The Adventures of André & Wally B. Each short is priced at $1.99, and for the first time are available individually. Steve Jobs just this very minute announced at his Keynote at Macworld ’08, movie rentals on the iTunes Store. Studios that have signed on include, Disney, Warner Bros., Paramount, Universal, Sony, Touchstone, Miramax, MGM, New Line Cinema, Lionsgate and Fox. This means you can now (If you don’t already own them first of course) rent your favourite Pixar film without even leaving your house. The price for each rental is $2.99 for a library title and $3.99 for a new release. Movies will be available 30 days after the DVD release. You have 30 days to begin watching, but then 24 hours to finish watching the rental. The service is only available in the US currently, but plans for it to go international later this year. Yet again another avenue for Pixar fans to rent/try/buy their favourite Pixar films if they don’t have them already. NB: Image Courtesy of MacRumors. UPDATE: 100 HD movie titles with 5.1 surround sound for rental starting today for $4.99. No confirmation yet but it looks as if Ratatouille will be available in this format. UPDATE 2: Long-time Pixar collaborator, Randy Newman, played the closing song at the keynote which has just ended. UPDATE 3: The keynote is now available for your viewing pleasure at Apple.com, and if you are not interested in the stuff at the start, skip to 1:16:25 to watch Randy Newman sing "A Few Words In Defence Of Our Country" followed by "You’ve Got A Friend In Me". The sly ol’ devil even mentions a cut love-scene between Woody and Buzz in Toy Story. 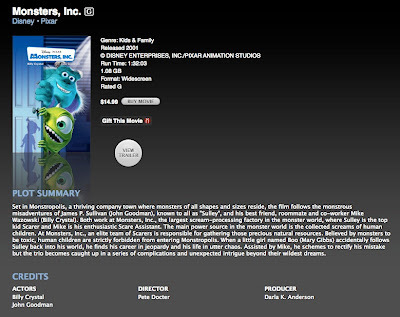 iTunes Store, Merchandise, Monsters, Inc.
Monster’s Inc. is now available for purchase on the iTunes Store for $14.99 USD. Now all that is missing is Toy Story 2.